brought to you by Jones Oil – the home heating oil provider. I control the majority of the world’s wealth, I’m mainly found in Russia and everyone just WISHES they were my kid. What am I? Yep. You guessed it. I’m an oil tycoon. You don’t need a degree to be an oil baron, in fact some of the most successful are college drop-outs or inherited their oil companies from their parents. What those at the top have in common however, is ambition, drive, a savvy business sense and at times, very expensive tastes. Here’s our top ten oil tycoons. Nigeria’s first female billionaire Nigerian Folorunsho is relatively new to the billionaires club and can boast that her wealth is self-made. She dabbles in various industries and is the vice chair of Famfa Oil Limited. Forbes estimated her net worth at $2.5 billion. She gives back through philanthropic ventures include the Rose of Sharon Foundation that provides scholarships and business grants to widows and orphans. This Saudi Arabian/Ethiopian businessman has oil refineries in Morocco, Saudi Arabia and Sweden. It was the building of Saudi Arabia’s nation-wide underground oil storage that gave Al Amoudi his big break – a $30 Billion project, quite the leg-up. He is the second-richest person in Saudi Arabia, after the country’s Prince of course, because that would be rude otherwise. His investments in Sweden saw him honoured with the Order of the Polar Star by King Carl XVI Gustaf of Sweden. His net worth in 2012 was $12.5 billion. This Russian self-made billionaire was orphaned as a child and dropped out of college, but he didn’t let any of those things hold him back. Roman makes his riches from stakes in oil, steel, aluminium and gold. While his net worth of $13.6 billion doesn’t put him at the top of the rich list of oil tycoons, he can boast that he owns his very own football club (Chelsea) and, like, a really, really big yacht. The biggest in the world, in fact. Okay it’s settled, we’re moving to Russia to make our fortune. Viktor is one of Russia’s top three richest people with Forbes putting his fortune at an estimated $17.2 billion. When he has some downtime from his investments in oil, telecoms and chemicals he can usually be found dusting his egg collection. Viktor boasts the world’s largest collection of Fabergé eggs. Fifteen of them. Let’s be honest, fifteen eggs doesn’t exactly sound overly impressive does it? But we’re sure they were pretty pricey. Mikhail is one of the younger oil tycoons on this rich list, coming in at a youthful 49. He founded Alfa Group in 1989. He’s now worth $17.6 Billion. He is a supporter and instigator of Jewish initiatives in Russia and Europe, in particular the Genesis Philanthropy Group that promotes Jewish identity among Russian-speaking Jews world-wide. He also owns Alfa-Eco and Alfa-Bank. We bet he drives an Alfa Romeo too. India’s richest man, Mukesh, inherited his company, Reliance Industries from his father. He initially dropped out of college to help his father expand the growing company and expand it he sure did. His personal wealth comes in at $19.6 billion, not too shabby. He doesn’t own a massive yacht but he does live in a private 27-storey building in Mumbai. Does that count? Charles and David Koch inherited Koch Industries from their father Fred, who founded the company in the 1940s. Koch Industries was named the second largest privately held company in the US last year, with an annual revenue of $115 billion. They bought out their other two brothers for $1.1 Billion which now puts their worth at a hefty $34 Billion each. Quite a sum and they like it that way. Charles famously said the company will offer public shares “literally over my dead body”. Aw c’mon Charlie! Sharing is caring. The richest of them all, and one of the most famous surnames in the world. Born in 1839 John Davison Rockefeller, Sr. was co-founder of the Standard Oil Company, which dominated the oil industry and domestic kerosene market. When he died, two months before his 98th birthday, Rockefeller’s net worth was $663.4 Billion. Making him the wealthiest oil tycoon ever. Standard Oil developed over 300 oil-based products including tar, paint, Vaseline petroleum jelly and chewing gum. Often under fire for his questionable business tactics, Rockefeller revolutionised the petroleum industry nonetheless. Admit it. This is how you imagined all oil tycoons looked. It’s hard to put a net worth on this Dallas based oil baron’s actual fortune because he kept Ewing Oil’s books close to his chest. But if his wife Sue Ellen’s jewellery was anything to go by, they weren’t doing too badly. His rumoured dodgy deals and run-ins with his younger brother and partner Bobby threatened the future of the company many times. Yes you could argue that he’s not a real oil baron, but to many, he’s the only one that comes to mind. TV Guide voted him #1 in their 2013 list of The 60 Nastiest Villains of All Time and that’s quite the achievement. brought to you by Jones Oil – The home heating oil providers. Oil is everywhere. Whether you’re filling up your car, sketching with some crayons, or wearing pantyhose (yep that’s right, their nylon is a petroleum-derived thermoplastic), you’re using it. Our society relies on it fundamentally. Without it, we’d probably still be trying to keep warm with mammoth fur. Well, maybe things wouldn’t be that bad, but just to make sure, let’s oil up our thinking muscles and share some fuel for thought. Eh? Eh? … I’ll get my coat. As it is so often, the Chinese were the pioneers. 2,000 years ago, they were developing deep drilling, and paved the way for extraction. 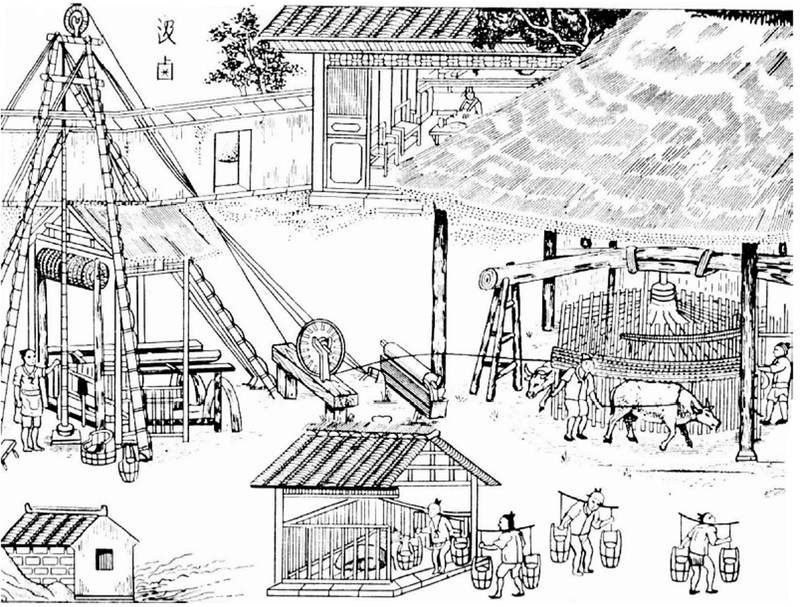 Drills were constructed using bamboo, and before you ask, yes, pandas were an incredible nuisance and consumed countless rigs.The Chinese along with the Japanese, who referred to oil as “burning water”, used the fuel for lighting and heating. This very bright Persian scholar, called Razi, invented kerosene and with it, the ability to have a reliable light source. This was a real game changer and really lit up the oil scene. However, it wouldn’t be till 1854 when Canadian geologist, Abraham Gesner would distil it for commercial use. While Gesner was making a few bucks selling kerosene lamps. Benjamin Silliman, who really should have been called Benjamin Cleverman, was over at Yale distilling petroleum from crude oil for the first time. With access to petroleum at any time, the world was our oyster in terms of innovation. Oil is now the world’s most important source of energy, it’s precious, inspiring movies that star big names like Antonio Banderas: Day of the Falcon. But also about 90% of our vehicles rely on oil. That’s a lot, but that’s not all. Oil is the raw material for just loads of chemical products including pharmaceuticals, solvents, fertilizers, pesticides, and plastics. Here’s a few of our favourite products that wouldn’t exist without oil. Some are unexpected, and some are downright outrageous. And all of them rely on black gold. Praise this invention. It has saved countless children from the trauma of a kiss from a toothless grandparent. Not only is it involved in the adhesive element. The synthetic flavouring of the teeth glue is often derived from petroleum. So if I had no teeth and oil didn’t exist, “Denture Adhesive” would sound like “Enshure Ahhesithh”. And that, ladies and gentlemen, is science fact. No one would disagree the lather is a lot of fun. It’s almost magic. Why does it smell so good? That fragrance is again, yes that’s right, made from oil. In fact, 95% of synthetic fragrances are created from petroleum. Me: “Shampoil more like, am I right? Oil is the primary source for some 40 basic chemicals on which 40,000 chemical products are based. Including ice cube trays. Before these you had to buy ice in a shop but ice cube trays puts the power to mould ice in your hands, but be careful, absolute power corrupts absolutely. Where to start? Today most aspirin is created using phenol, a compound derived from crude oil. Helping millions through the stress of pain and mitigating such conditions as arthritis, most of us have used aspirin from one time or another. Again, we can thank oil.